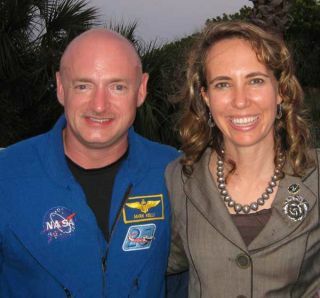 Wounded Congresswoman Gabrielle Giffords will undergo intensive brain surgery in Houston this morning (May 18), three days after watching her astronaut husband, Mark Kelly, launch into orbit aboard the space shuttle Endeavour, according to news reports. Giffords, D-Ariz., is scheduled to have cranioplasty surgery at Memorial Hospital in Houston today, as her husband and his STS-134 crewmates link up with the International Space Station on Endeavour's final trip to the orbiting outpost, reported ABC News. The surgery is expected to be a critical step in her recovery from a failed assassination attempt in January. Giffords suffered a bullet wound to the head on Jan. 10 at a community outreach event in Tucson, Ariz. She has reportedly made exceptional progress in her rehabilitation so far. After Giffords was shot, doctors performed emergency surgery to remove a portion of her skull, which allowed her brain to swell. In today's cranioplasty procedure, doctors will replace a piece of Giffords' skull with a plastic implant, reported the Associated Press. The surgery was scheduled without regard to the space shuttle mission going on. "When she's ready, they're going to do it," Carusone said. Meanwhile, Kelly is commanding Endeavour's 25th and final mission to the space station. The shuttle is carrying a $2 billion particle physics experiment and a supply of spare parts for the orbiting laboratory. The shuttle docked to the space station this morning (May 18) at 6:14 a.m. EDT (1014 GMT), and will remain at the orbiting laboratory until May 29, before journeying back to Earth. The shuttle's veteran crew plans four busy spacewalks and a host of robotic arm activities to install the new units and perform maintenance on the station. Visit SPACE.com for complete coverage of Endeavour's final mission STS-134 or follow us @Spacedotcom and on Facebook.